Robert McMahon, Jr. started his career in the investment banking industry where he excelled as a personal producer and was named a member to the John Nuveen Advisory Council for excellence in municipal bond financing. 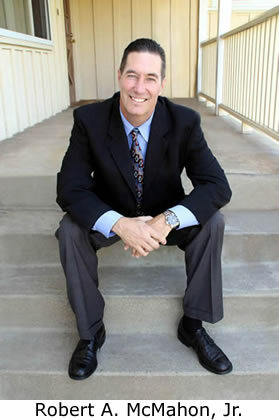 Robert is a former United States Marine and has extensive experience working with state and local government agencies. He has received commendations from California Governor Pete Wilson and Los Angeles Mayor Tom Bradley for his work with non-profit organizations that provided jobs for disadvantaged youth. This experience changed Robert forever and propelled him to embark on a journey to teach students with developmental disabilities. Robert earned a California Special Education Teaching Credential from San Diego State University and has had the privilege to teach students with severe emotional disabilities, mental retardation, autism and various other learning disabilities. Robert's son Antonio, his little "Angel", has autism, epilepsy and cerebral palsy. Robert was recruited into the mortgage banking industry in 1997. Robert comes from a family that has a proud history in public service. He understands the critical need for safe and permanent housing for all “public servants” who educate, protect, and serve the needs of our community. Robert is an expert in VA, FHA, CalSTRS for Teachers, PERS for State Employees, and all Conventional mortgage programs to help both the “investor” and the “first time homebuyer” access down payment assistance and grant monies. Robert and his wife Ana are co-founders of www.Homes4Angels.org a 501(c)(3) corporation that helps Exceptional Families access innovative housing solutions.